Pet Foods was established in 1972 and has grown to become the leading manufacturer of pet foods in Ireland. John Mackle is the current managing director who succeeds his father who founded the company. John has been responsible for the recent rapid growth and expansion of the company. Mackle Pet produce both wet canned and dry bagged food in a range of flavours and sizes. Some of the mouth watering (for dogs & cats!) brands are Champion, Cat Club, McGrath & Jessie. Enterprise Tondelli were commissioned to upgrade the packaging end of the production line. 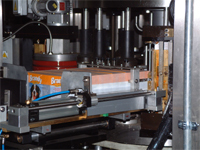 The existing configuration consisted of an aging labeller and shrinkwrapper with manual palletising. The method for packing film only multi-packs into trays and then wrapping was a labour intensive offline system. The design brief for the new project was to replace the existing inefficient machinery, to provide the capability to automatically produce loose cans in trays and film only multi-packs which then require packing into trays. A high degree of packaging flexibility was required to be able to produce a number of differing final pack formats. In addition a fully automatic low level palletiser was specified. The significant challenges were to accommodate the new equipment in the limited space available and to cause minimum disruption to production. Ultimately a compact layout was proposed which made best use of the space and rationalised the use of operators. A rotary wraparound hot melt glue, paper labelling machine was supplied. For the shrinkwrapping processes two Baumer wrappers were used. Both machines use non-sealing bar overwrapping technology, thus giving a more pleasing pack with printed and registered film. The film only multi-pack machine has continuous collation and runs i n two lanes. The slower tray packer wrapper uses intermittent collation. The palletiser is supplied from Fipal and uses the so called ‘Bomb’ door arrangement to deposit the layers, thus giving a tight pallet. The complete system is automated and operated from a central control point. The complete project from design through to commissioning was handled by Enterprise Tondelli. With the growth of interest in multi-flavour packs it was realised that to maintain market presence that the packaging facility would need to be further upgraded. Again this complex system would need to be fitted into a very constrained area. Mackle Pet Foods again approached Enterprise Tondelli for a solution to this requirement. The design brief was for a system to allow the production of multi-flavour packs both loose in tray and in various film only pack sizes. After a considerable technical study a highly flexible robotic solution was decided upon. The system would be capable of making up to four flavour packs. This was achieved by pre-palletising loose cans of various flavours and then re-introducing these to the packers. It is also possible to palletise cans coming from the labeller whilst de-palletising multiple flavours for the multi packs. The total concurrent machine capacity was 1000cpm. A sophisticated laning and control system was required. Enterprise Tondelli were favoured with the contract to supply, install and commission the complete multi-flavour can packaging system. The project was delivered in distinct phases to give minimum disruption. The system was installed and commissioned early in 2007.